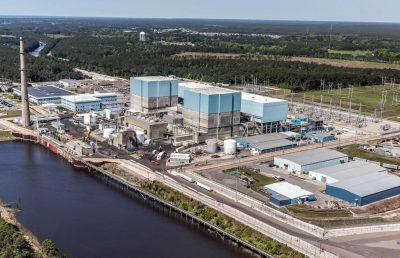 The two reactor Brunswick nuclear plant on the Cape Fear River in North Carolina may be critically threatened by flooding from hurricane Florence. The nuclear plant has a sea wall designed to withstand 22 feet of flooding according to the Nuclear Regulatory Commission. The National Weather Service in Wilmington NC reported on Thursday that the Cape Fear River is expected to crest at up to 22 feet on Tuesday Sept. 17 swollen by hurricane Florence storm surge and downpours. The seawall was constructed following the Fukushima nuclear disaster in Japan after a tsunami overtopped the sea wall and damaged plant electric power and controls leading to catastrophic meltdowns and release of radiation. The Brunswick reactors are the same GE Mark I reactors that are at Fukushima. It is highly likely that offsite power to the nuclear plant will be disrupted by hurricane Florence. In this case, onsite emergency generators will be required to maintain cooling systems for the nuclear plants and spent fuel ponds filed with highly radioactive waste. If water overtops the seawall, it can lead to electrical failure and potential for catastrophic events similar to the Fukishima reactor disaster that resulted in multiple reactor meltdowns and hydrogen explosions in overheating reactors. “It is extremely worrying that the Tuesday forecast is for a 22 foot flood crest at 22 foot sea wall at the Brunswick plant. Inadequate nuclear safety measures once again pose the unnecessary risk of catastrophic accidents,” said energy expert Roy Morrison. Roy Morrison‘s latest book is Sustainability Sutra Select Books, NY 2017. He builds solar farms.